Messes are a common occurrence in my house, and messy fun is also rather common. I guess I figure I can’t avoid the messes, so might as well make them fun ones! Yesterday afternoon a box arrived from the folks at MyBlogSpark and Crayola and the boys were dying to see what was inside! Everything I received in my box, could be yours too – just keep reading! 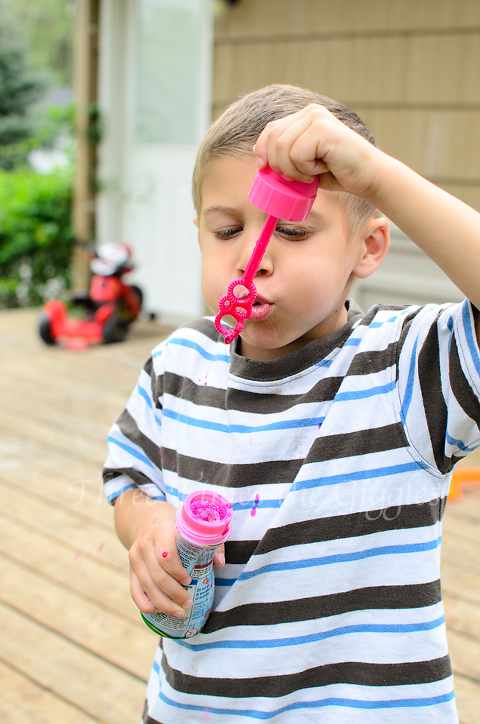 Our messy fun kit contained 3 bottles of the newly reformulated Crayola Colored Bubbles and a Bubble Launcher with two more bottles of the bubble solution. I say reformulated, because apparently the first time these were released the bubbles stained skin and clothes terribly, so Crayola (wisely) tweaked the recipe and made the solution more washable. So my thoughts? The bubbles are fun! However, I was expecting the bubbles to really be colored, not just slightly tinted. The pictures on the box make it look like you’ll actually see vibrantly purple, pink, and yellow bubbles, but that’s not exactly the case. The first time we blew some of the pink ones, one of the boys said “Hey! It’s not pink! 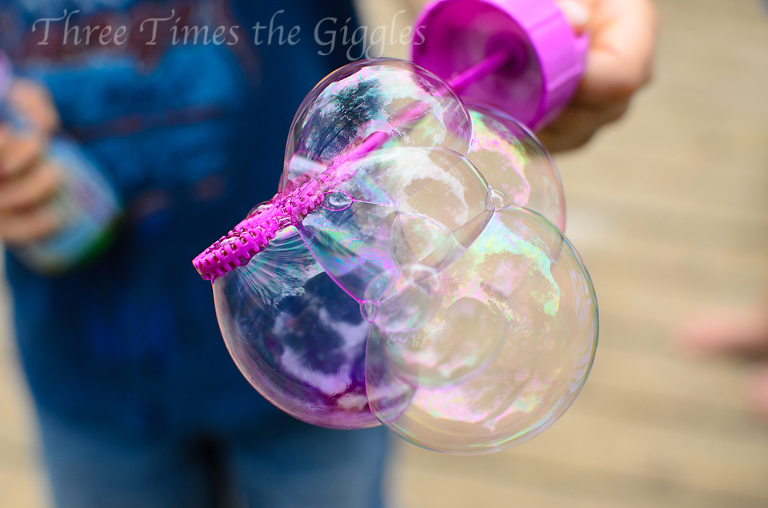 It looks like a regular bubble!”. Now, sometimes the bubbles are more heavily colored and you can tell they’re different, and if you look at the “bottoms” of the bubbles (like in the picture above) you can see the color collecting there. The Bubble Launcher that came in our kit was terrible! I don’t know if we got a dud, or if they’re all like this, but all the cranking in the world (by me or the boys) only resulted in 3 or 4 bubbles coming out every 5 seconds or so. Such a bummer! 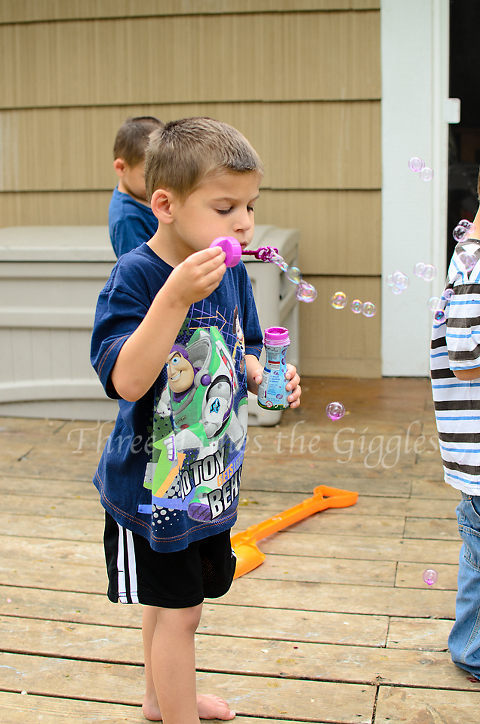 Now, all that being said… They’re bubbles and bubbles are popular with my kids! Know what else they are? 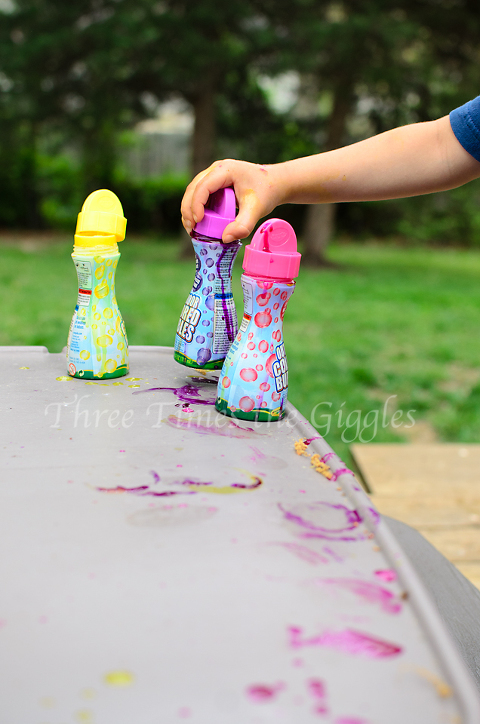 They’re messy, and messy is popular with my kids too! There’s a warning label on the boxes that says not to use these at weddings…. No joke! Could you imagine these spots on a wedding dress? Yikes! You know what? The spots washed out of their clothes! I had the boys change into play clothes, just in case, and I washed their clothes later that night (using our homemade laundry soap) and while the set-in stains from who knows what didn’t come out, the bubble spots did! Awesome! And the stains on the skin? Came off by just rubbing a paper towel on it! Sweet! Better yet, the drops on my deck and the boys’ picnic table easily hosed off. 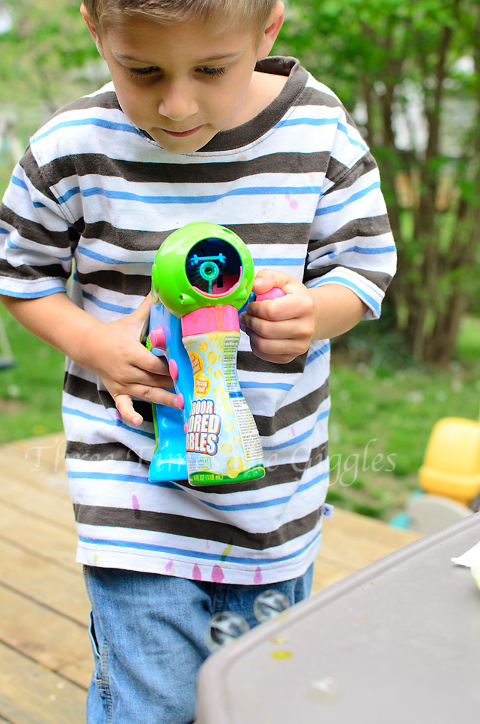 Bottom line: While they weren’t as colorful as we’d hoped, and the bubble launcher was a bust, the boys had a ball with the bubbles and I’m sure will be begging me later today to let them play with them again. They washed out of clothes, the deck and skin easily, which is a big plus with me. Here are Chase and Ty’s thoughts on the bubbles (and whether or not it’s going to rain apparently) in video form! There you have it – overall the colored bubbles were a hit! Simply leave a comment below telling me what your favorite kind of messy fun is! Giveaway is only open to US Residents. Winner will be randomly selected and announced on April 12th. Winner will have 48 hours to claim their prize or an alternate winner will be selected. Disclaimer: MyBlogSpark and Crayola sent me this product to review and giveaway. The package shipped to my home was the extent of the compensation for my time. All of the thoughts above are totally my own, and not those of Crayola or MyBlogSpark. Once I washed them and dried them, those two shirts that had been SOAKED in the bubbles were white. And I didn’t add anything special to the wash for them either. So, yes, I was quite impressed at how well they washed out. We had some spots on our driveway for a while, but between the sun and the rains, they went away before I realized it. Glad to hear they changed the formula we had them when they first came out and they stained like crazy. I’ll have to try the new ones. My personal favorite messy fun is annual holiday Christmas cookie baking.